Once I began reading about the Uco valley (Internet trip planning) I knew I had to visit. [ed. one of many spectacular views in the valley, this from Bodega Salentien] It just sounded too incredible: the region where the big money was taking up roost; bodegas spread even more few and far between than Maipu or Lujan du Cuyo, highest altitude vineyards in Mendoza province, and proximity to the second largest peak, Tupungato at over19,000 feet, in the Andes. Knowing there would be a major peak that I could actually see with the naked eye while touring vineyards was important because it meant I could easily torpedo any move to take a day-long bus ride (10 hours) to Aconcagua, the tallest Andean peak that can only be seen after a long bus ride up the mountain and which is a popular tourist activity when at a loss for what to do next in Mendoza. When my team was at a loss for what to do next in Mendoza we asked Posada de Rosas hostess Ellen and she suggested we have lunch in the Parque San Martin where tourists seldom ventured. As usual she was perfectly correct. Before we review the day in Valle de Uco, I want to finish the second half of the previous day in Maipu and Lujan de Cuyo. 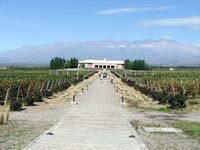 After touring Bodegas Tempus Alba and Achaval Ferrer we were driven to the Carlos Pulenta compound in Lujan de Cuyo where we were set to have lunch at the Mendoza’s finest restaurant La Bourgogne followed by a bodega tour. One can be easily fooled by a first look at the Pulenta facility. It presents as a familiar Latino rectangular compound centered around an open courtyard. There is a posada with a few rooms above the entrance and the restaurant is at the other end of the central pathway. the bodega? All underground. And it is huge. The bodega tour was efficient. We saw the fermentation tanks and long open storage rooms. Unlike any other winery I have seen, the bottles are stored for aging individually in piles along the walls. This requires multiple opportunities to break them form the excessive handling, from the bottling line, to the storage area, back to the bottling line for labeling, and then into the shipping cases. The most interesting part of the tour was the tasting room (pictured here). I was not interested in tasting any Pulenta wines but I was very interested in examining the wall of Lujan dirt that comprised the room’s longest wall. The lunch is worth mentioning. The food was very good but the service, as noted by tasting team member PeeWee, was “indifferent”. We ordered the 2004 Vistalba Corte B from the wine list ($31 US) which was anything but indifferent. Vistalba is one of many Pulenta’s lines. Corte is the Argentine word for a blend. There is also a Corte A and C. Corte B blends 57% Malbec, 30% Cabernet Sauvignon, and 13% Bonnarda. Blueberry flavors. Feel was luscious. Liked it mucho [ed. even with all the cab?] Made a note to buy it in LA. Price is $25. Corte A blends Malbec and Cab in more equal amounts, but the Corte C is the one I have to try. It is 85% Malbec and 15% Merlot which, in my view, is the better blend. Salentein is the Pulenta compound in spades. It is a posada, an art gallery and a bodega in three separate buildings each occupying its own acre in a triangle arrangement. The photo above shows the walk form the gallery to the winery. I wanted to stay here but could not arrange it. The bodega, like Pulenta, is underground, however, you could fit about six Pulenta facilities into this one. If you have ever visited the Medici Tombs you have an idea of the scale and spectacle. I had to ask the guide who was buried here. The place is stupefyingly stupendous. The place is almost overwhelming with its multiple underground levels. Art is not just in the gallery but everywhere…inside and outside This piece is adjacent to the elevator door between hose storage and the “temple” storage room. Eventually – and we were in no rush – we arrived at the tasting room. Here is what they poured us. Salentein’s premium line is Primus, not tasted. I have found that Salentein wines are not easy to locate, at least in LA. This is a shame because they are very good value and decent wines. They offer a wide range of varietals, as well. Bodega Andeluna is the creation of Ward Lay, of Frito-Lay. That is correct. The same man who brought the world cheet-ohs owns a world class winery in Valle de Uco. We had a fabulous experience here. This was our lunch stop and, unlike the other “premium” dining spot, this was the top stop for the entire trip. We never did the bodega tour because lunching with Chef Pablo cooking and serving us was too much to hurry through. Because we took the premium tasting meal we did taste some really nice wines…and ate some truly special food…and had some excellent chatting with Chef Pablo. Here are the wines…Michel Rolland gets consulting credit. San Francisco Wine Exchange imports. 2005 Andeluna Chardonnay Reserve: Faint hint of sulfur and minerals on the nose, green olives. Nice mineral flavors. Oak is way in the back. Lemon cream. Meringue. This is a chard I can drink! Grown at 4,000 feet with 12 months in French oak. 13.1%. Bravo! 2006 Andeluna Malbec $8: Buttered popcorn. White pepper. Younger, spicy. Lean middleweight. Excellent. Rich. Chef Pablo loves this wine. At this U10 price it is a total bargain. 14.2%. The Missus says it tastes a lot like a wine Jim Moore, or Bob Mueller, a couple of those under-the-radar Napa winemakers covered by tBoW, who have just been making great wines for a slew of folks over numerous decades. Jim’s label is l’Uvaggio di Giacomoand he used to make a wine named Parador. Bob is the winemaker at McKenzie-Mueller, profiled on this blog several times. Now if we can just figure out where to buy some! !